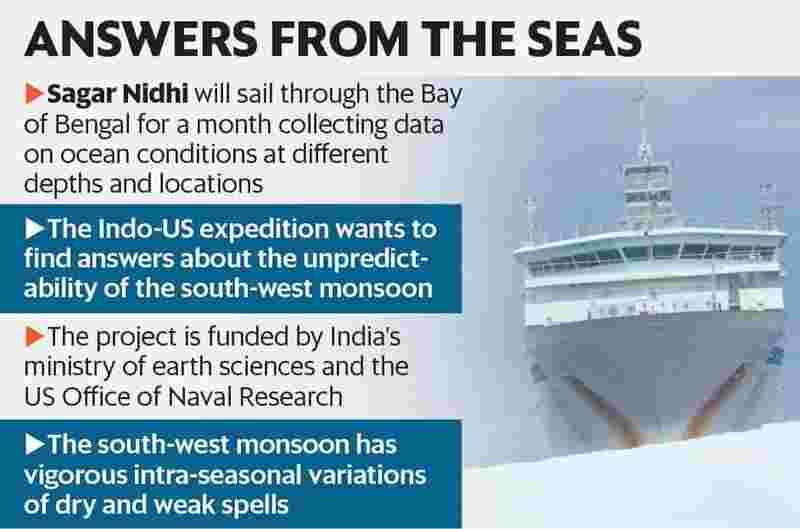 New Delhi: The Indian Ocean Research Vessel (ORV), Sagar Nidhi, will set out from Chennai on Friday as part of an Indo-US expedition seeking to find answers to the vagaries of the Bay of Bengal-fed southwest monsoon, which accounts for 70% of India’s annual rainfall. Sagar Nidhi will sail through the Bay of Bengal for a month collecting data on ocean conditions at different depths and locations and study the underlying principles of interaction of the uppermost layer of the ocean with the atmosphere. The project seeks to cast light on the complex mechanics of the monsoon, which have confounded researchers for a long time. The biggest challenge is the unpredictability of the weather phenomenon, including, crucially, why there are breaks in the June-September rainy season. The research project, which began in 2013, is funded by the ministry of earth sciences, under the national monsoon mission, and the US Office of Naval Research, which has been working with institutions such as Sri Lanka’s National Aquatic Resources Research and Development Agency. “It is crucial for farmers and policymakers to know when and for how long the monsoon will remain active over, let’s say, central India. For that, we need to predict the phase and amplitude of these sub-seasonal variations, and also improve the understanding of mixing of fresh water in oceans. These improvements are required in our models for better prediction," said B.N. Goswami, a former director of Indian Institute of Tropical Meteorology, Pune. The south-west monsoon makes its onset over the Indian mainland every year in June, but it is marked by vigorous intra-seasonal variations of dry and weak spells. “It has been a kind of mystery as to why these long breaks exist during the monsoon season. There are problems in (existing) atmospheric models which are not good at predicting these breaks with any skill beyond seven days. The challenge is to extend the prediction skills beyond the current levels to make better forecasts," said Debasis Sengupta, chairman, Centre for Earth Sciences, Indian Institute of Science (IISc), Bengaluru. IISc is the chief coordinator of the project. Scientists, led by Indian National Centre for Ocean Information Services (INCOIS), Hyderabad, will gather detailed observations on the wet and dry periods that alternate roughly every 10–50 days during the monsoon. The data will be collated with information collected by a group of researchers on-board US research vessel Thomas G. Thompson to study the Indian Ocean. The forecasting skills of the existing models are limited, largely due to their inability to represent the complex interaction of the north Indian Ocean with the atmosphere, which is key to understanding the origin of variations in monsoon. “The variations are periodic, but inconsistent. We do not know what controls their genesis and propagation. Models have problems in simulating them realistically. We do not know what role the oceans play here, whether they force the monsoon or respond to it. So such crews are important to make measurements to refine our models," said Francis P.A., a scientist from INCOIS. “Current atmospheric models do not get physics of tall monsoon clouds right," added Sengupta. “These deep clouds are not well-represented in the computer models. Secondly, the interaction of atmosphere with the ocean is also not well-represented." The intra-seasonal variability of the monsoon is a major problem in India, where long dry spells have been associated with droughts, while long wet spells have caused floods, landslides, loss of life and damage to property. Skilful prediction of these varying patterns could help officials prepare better for the monsoon each year. Scientists on the ship will also release radiosondes—types of instrument packages attached to weather balloons—to gather meteorological data. India Meteorological Department has also released them from its coastal stations.